Yesterday I celebrated turning 32 years old…well, sort of. I started out celebrating, but by the end of the day, my birthday had taken a turn for the worse. For those of you following my blog, you know we are anxiously awaiting an appointment with an Ear Nose and Throat specialist next week. 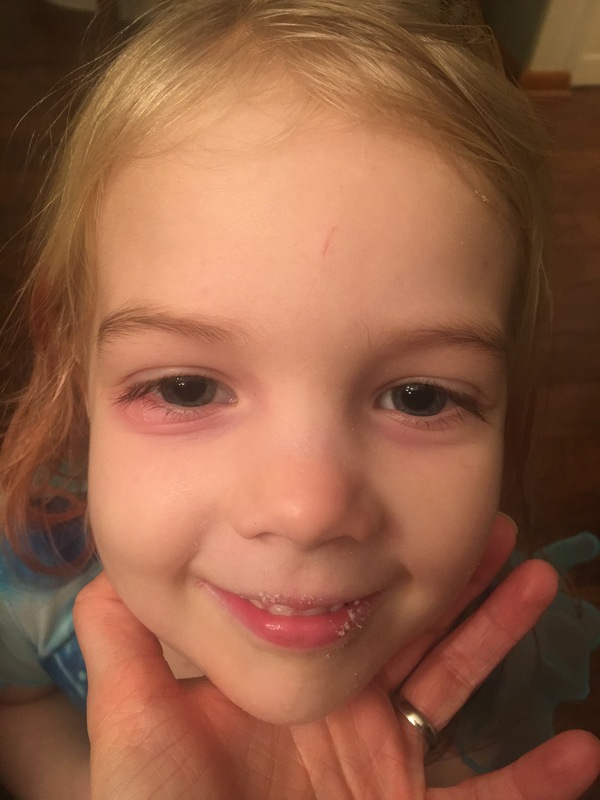 The specialist will be investigating my 4 year old daughter’s asymmetrical, enlarged tonsil. We’re not sure what is causing the abnormality but fear the underlying cause could be cancer. Her appointment is on the 10th and we are praying to hear that she just has a big tonsil. 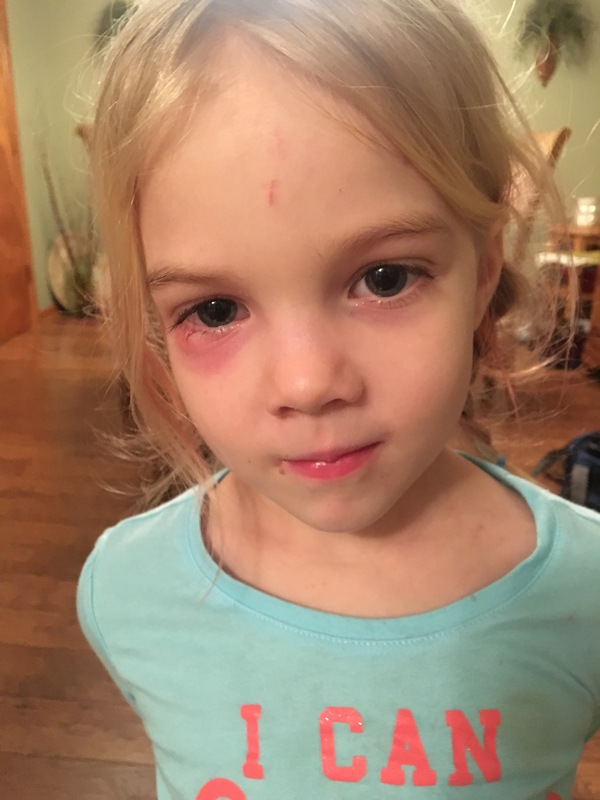 In the mean time, Jera woke up with a strange rash under her right eye two days ago. With a long history of allergies and eczema, we are no strangers to rashes. So I gave her a dose of Benadryl and we went about our day. However by yesterday morning, the rash had become worse and her eye had begun to swell. Time to get another punch on the old doc card. I wasn’t sure what to expect but was utterly shocked to find that my 4 year old has shingles. SHINGLES. Yes, the virus from chicken pox that you normally hear about from your 90 year old grandparent. I left the doctors office in a bit of a daze. 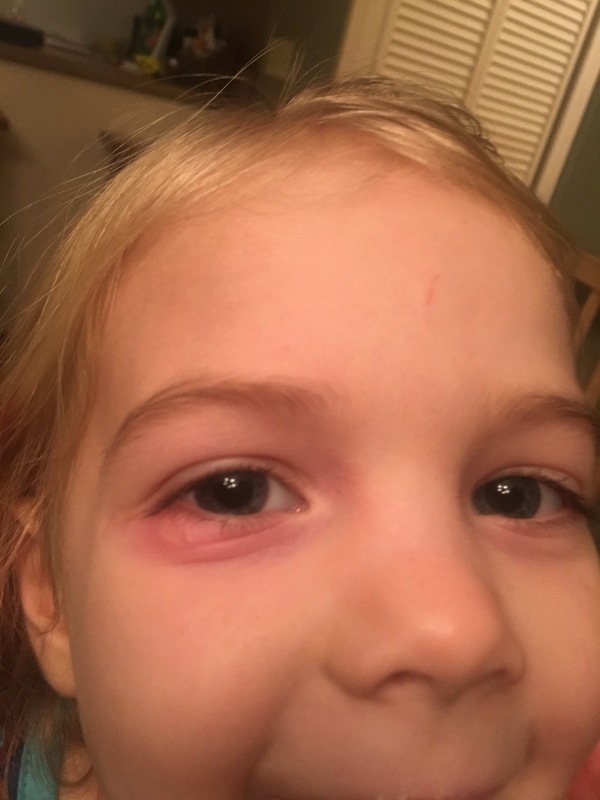 Because the shingles rash is so close to her eye we have to get into an eye doctor today to be sure the shingles hasn’t made it into her actual eye. Shingles in the eye can cause many vision problems, even leading to blindness. So I jumped online to try to understand how my young daughter contracted something that I had never expected. Let me preface this by saying, I realize this is a mistake. I know we should never Google any illness. It’s never good news. But my heart sank when I read that shingles is extremely uncommon outside of the elderly population unless a person has a suppressed immune system due to HIV or cancer. There was that word again. Cancer. The tears came fast and hard last night. I am praying my little daughter is fine. I am trying to remain logical and rational. I know it could be and hope it is nothing. But I am scared. The 10th can’t get here fast enough for my little family. 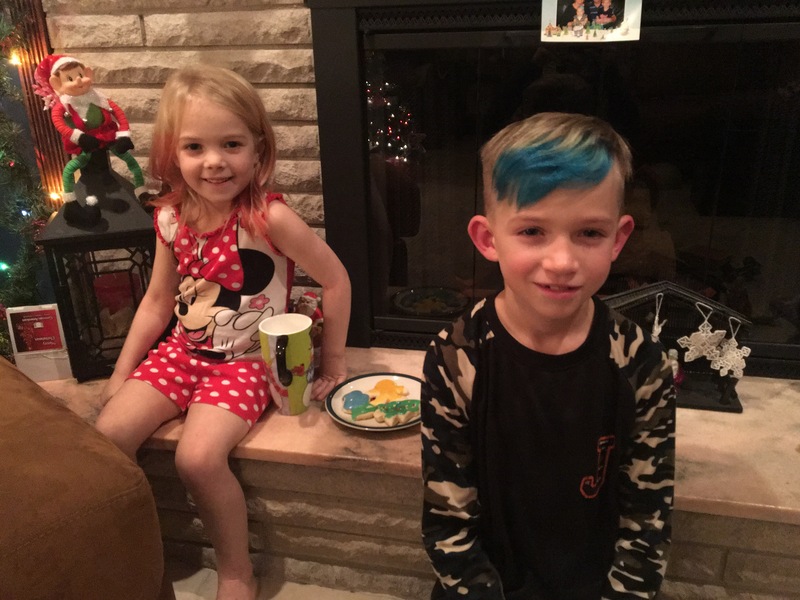 I continued to peruse online last night and found a blog where another mother has a child with severe eczema, like Jera, whose daughter also had shingles at 4 years old. Jera is prone to skin infections and her immune system is in a constant struggle against her eczema and allergies. She just had the stomach flu two weeks ago and pneumonia a month ago. It makes sense that her immune system would be down. She is bright, cheerful and happy. She doesn’t understand the tears or hugs or worry. I am scared but trying to hold fast to my faith that God will guide my family through this crisis. We’ve made it through things I couldn’t have imagined before. This time I lean on Him with my entire being as I struggle to maintain normalcy in a moment where I feel anything but normal. Please continue to pray for Jera. For her strength, health and resiliency. I turned 32 yesterday and I continue to learn daily that faith and family are the two things that make this life, not only bearable, but beautiful. Today I choose to believe that anything is possible with the help of God. Today, a year older, I choose to be happy in the face of adversity. I will take it a moment at a time and be thankful for the time I am given with the sweet little monsters I call my children. Speaking of which, I get to wake now and tell my oldest he has a two-hour snow delay…this parenting thing can still be fun! Parenting is both the hardest and most rewarding responsibility I’ve ever known. Today and everyday, I choose to be thankful for it, both the burdensome worry and the great joy. It’s all part of it. Duty calls….off to make the snow day announcement! Meet Jera. She is my beautiful, 3-going-on-17 year old daughter. Full of energy, sass, love, fishy kisses and the best Jera hugs. She is my side-kick in all things. Her favorite things are Barbies, PJ Masks, Taylor Swift, strawberry milk and the Fresh Beat Band. She is resilient and teaches me every day what living without fear looks like. She also suffers from eczema…and I don’t use the word suffer lightly. But more on that later. Now I have to ask, could this be what the cure for eczema looks like??? We’ve been through a lot on this eczema journey, and after all we’ve tried, all the doctor appointments, steroids, creams, lotions, all of the money spent, could the answer really come down to some supplements and essential oils??? I’m feeling skeptical and if you’ve dealt with eczema, you’ll know why. At 13 months old, Jera’s skin completely and radically changed. She went from clear, soft, gorgeous baby skin to being broken out with red, rough and bumpy rashes all over her body, most severely on her elbows, wrists, knees and ankles. Her skin has gotten so bad at times that she’s had to take antibiotics to combate infections that have entered in through her open wounds. Since that time, we’ve been through EVERY over-the-counter topical treatment. Aquaphor, Cetaphil, Eucerin, Gold Bond, oatmeal baths, Epsom salts… We’ve been through the pharmaceutical gammut as well. At one point we actually found a topical steroid that did wonders for her skin, only to find out it was no longer available when we went for the refill (it had been tied to Luekemia 😖). Needless to say I had a serious moments pause about Jera’s eczema treatment right then and there. This entire time, we’ve been following the advice of specialists. Her very own dermatologist and allergist and still no answers. During our tenure, their advice has gone from one extreme to another. Don’t bathe her. Bathe her every day. Remove all carpeting from your home. Wrap her in a wet blanket and make her sit for an hour…it’s a great cold compress for the skin. So…I did mention she’s THREE, right?! At her last dermatologist appointment, the doctor suggested I begin punishing her when I see her scratching. His latest hypothesis is that if she wouldn’t scratch herself, she wouldn’t have the rashes and sores on her body. When I said “But she scratches herself because she itches?? ?”, he suggested I start giving her Benadryl 4 times a day. In his words, she may be a little “out of it” but she won’t be itchy. We, as patients, put our trust in our doctors. We have to. They are the experts and we, as patients, need their knowledge and advice. My mom, Jera’s grandma, was with us at this appointment. I was so thankful to have her there to validate that this doctor didn’t have Jera’s best interest at heart. He wasn’t invested in her healing. And so it was my sign that it was time to move on. So here we are, nearly 3 years into this battle with Jera’s skin and she’s no better today then she was in the beginning. This is a picture of what her skin looked like this morning. Horrible, right?! I range from feeling desperate, to sad, to frustrated. At this point, I have realized we have to keep an open mind. There is an answer out there. Our prayers will be answered but I have to be listening, attentive and leave the doubt behind. I decided that if something comes our way, we will try it. We will not accept that she just has to live this way. Live having other children point to her red, swollen patches of skin and ask her what’s “wrong with her”. Live not being able to sleep at night because she itches so badly that she can’t rest peacefully. Live putting one toxic ointment on her body after another to get some sort of relief without knowing what the long term effects will be. There must be a cure. Enter Iridology. This is a science that evaluates the nerve endings in the iris to determine strengths, weakness, areas of congestion and stress, among other things inside the body. Several friends have shared their personal health success stories after visiting this particular Iridologist. So I took this as a sign and made an appointment. We had our appointment this week; the lady looked into my daughter’s eye and gave us her opinion. We left the store, and in hand, we have Recover Soothing Blend (oil), Silver Shield (gel), probiotics, Pau De Arco Extract, and Flax Oil. She advised us to give her plenty of lemon water. We’re supposed to cut down the dairy and wheat intake. Increase dark leafy greens…beets would also be a good choice (yes, I’m looking at this lady like she’s an alien…my daughter is 3 and I’m not really sure about the beets!). Her thought is that my daughter’s kidneys need help. Her body is reacting to EVERYTHING like it is an allergy because he kidneys have been overworked trying to remove the toxins from her body. Her kidneys can’t keep up. I’m not a doctor, obviously. There was more to her explanation than that but that’s what I pulled from it. If we can clean up her kidney function, her skin will heal but it will take a few months to see results. Could it be so simple? Some diet modifications, oils and supplements? I don’t know. But I’m thankful to have a new road to travel down. A new suggestion to try. It’s been a frustrating process, but we’re praying every day that we find relief. Realizing things could always be worse, we’re taking it a day at a time and pushing forward. If this isn’t the answer, we will have our ears open for the next opportunity to help our daughter. We won’t give up. Updates to come!